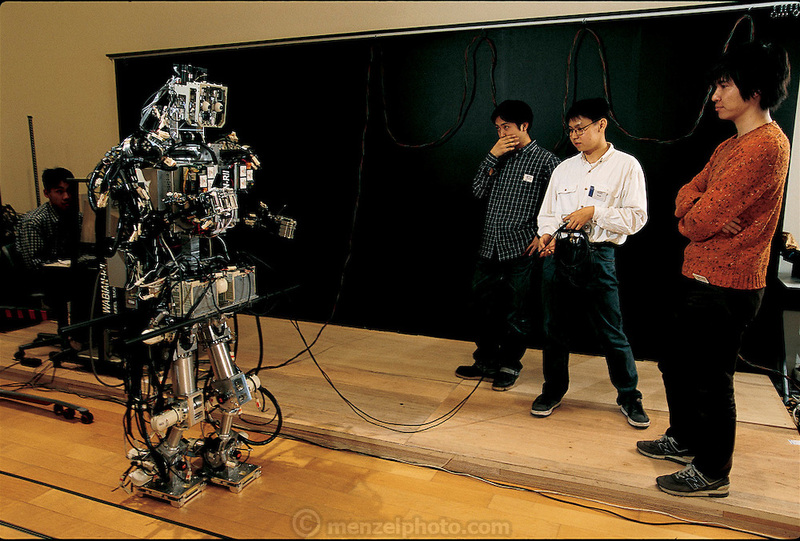 At a robotics exhibition in Tokyo, Japan, Samuel Setiawan (in white shirt) and two other Waseda University graduate students cautiously stand by during a lengthy prewalk checklist for WABIAN-RII. To their dismay, the robot initially has trouble negotiating the wooden floor, which is much springier than the concrete floor in the lab, where it had been programmed to walk. After some frantic reprogramming, Setiawan, the primary student researcher on the project, is able to make WABIAN walk its assigned path. From the book Robo sapiens: Evolution of a New Species, page 38.